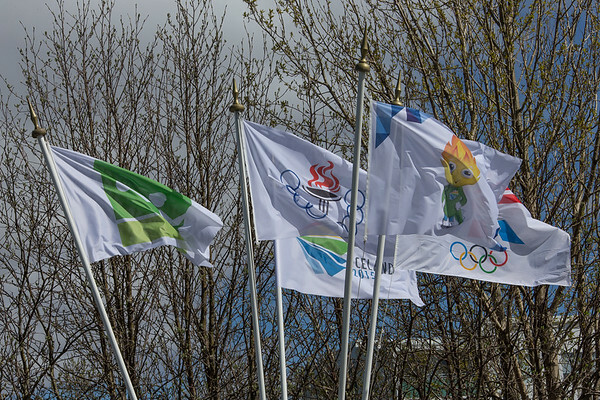 The flag of National Olympic and Sports Association of Iceland is white with logo. The National Olympic and Sports Association of Iceland (Íþrótta- og Ólympíusamband Íslands, abbreviated ÍSÍ) was created in 1912 and was officially recognized by the IOC in 1935. It is a member of the European Olympic Committee. There are two vertical flags for this NOC. The first one, seen at http://isi.is/library/Skrar (pg 10) shows the full logo (a cauldron in the design of the Icelandic flag with red flames, above the name of the committee in Icelandic) above their founding date "STOFNAÐ 28. JANÚAR 1912" (Established 28 January 1912). The second flag, page 22 of the same document, shows the exact same banner minus the founding date. Attached is the second flag in gif form, using a logo from ISI. The Icelandic Sports Association for the Disabled (Íþróttasamband Fatlaðra, IF) was founded on May 17, 1979 and serves as the main National Paralympic Committee for Iceland (the NPC does have a separate logo at https://www.paralympic.org/iceland but does not have a flag to my knowledge) and the sponsor of the Special Olympics. There are three main flags I have found for IF; all are white and uses the full-color logo. There are two vertical flags and one horizontal flag. The horizontal flag can be seen at https://www.ifsport.is/read/2015-01-07/sigrun-huld-saemd-riddarakrossi-falkaordunnar and both vertical flags can be seen at https://www.ifsport.is/read/2017-03-27/heidursmerkjahafar-a-sambandsthingi-if-2018. One version of the vertical flag has the text "STOFNAÐ 17. MAÍ 1979" below the logo; the other version omits it.